EDISON, NJ — QuickChek is once again teaming up with fire departments from around the state to heat up some culinary action and raise money for burn victims at the ninth annual Cooked & Uncorked food and wine festival at the Pines Manor in Edison on February 25, 2019. Sponsored by the New Jersey State Firemen’s Mutual Benevolent Association, the fundraiser benefits The Burn Center at Saint Barnabas Medical Center, the only certified burn treatment facility in the state. The event raises approximately $50,000 each year. This is the fourth year in a row that QuickChek will be participating in the event in which 26 fire departments will compete in an Ultimate Cook-Off with categories for “firehouse cooking,” “gourmet cooking,” and “dessert.” They will be judged on taste, presentation, display and cuisine. Judges include radio personalities Shelli Sonstein of Q104.3 and Bill Spadea of NJ101.5; professional athletes such as former New York Giants Super Bowl champions Bart Oates and David Diehl; and a variety of chefs and culinary professionals including QuickChek Senior Foodservice Category Manager Amanda Rose Shymanski. More than 1,000 people will have the opportunity to sample offerings from more than 30 restaurants, caterers, dessert shops and food service providers. They will also be able to vote for the People’s Choice Award. QuickChek, the Whitehouse Station-based fresh convenience market chain, will showcase its Shrimp & Corn Chowder freshly prepared, never frozen soup; Beef Stew; and Hearty Beef Chili. It will also provide a preview of its new Original Blend Iced Coffee and Oatmeal Chocolate Chip Iced Coffee that will be introduced in its 159 stores this spring. 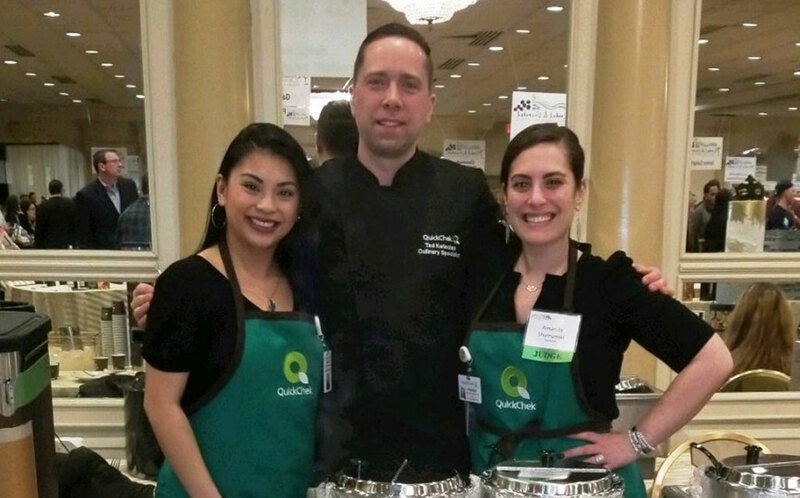 “This is a great opportunity where we can have people sample our best-selling soups, chili and our new iced coffee menu while continuing our mission of supporting our first responders and our communities,” said Shymanski, who is part of QuickChek’s foodservice team whose menu has been recognized throughout the industry for innovation. The family-owned company has 159 stores including 78 locations with fuel throughout New Jersey, New York’s Hudson Valley and Long Island. It supports local fire department fundraising drives across the state throughout the year as well as in time of urgency — QuickChek recently donated food, coffee and bottled water to firefighters as they worked to extinguish a multi-alarm fire at the Keep Wrapping manufacturing company in Washington Township in Warren County in November. Fire departments scheduled to compete in the Cooked & Uncorked Ultimate Cook-Off include units from Belleville, Bayonne, Clifton, Cranford, Elizabeth, East Orange, Hamilton, Harrison, Hillside, Linden, Long Branch, Maplewood, Millburn, Montclair, Morristown, New Brunswick, Nutley, Paterson, Plainfield, Rahway, Roselle, South Orange, Trenton, Union and Westfield. Tickets are $60 in advance and $65 at the door. To learn more or to purchase tickets online visit www.cookedanduncorked.com.